Article Message: Did GOD Provoke Satan To Attack Job? That same one being perfect and upright in the Sight of GOD, who had feared GOD and eschewed (shunned by choice) evil. Did GOD Provoke Satan to Attack Job? : REALLY…?? 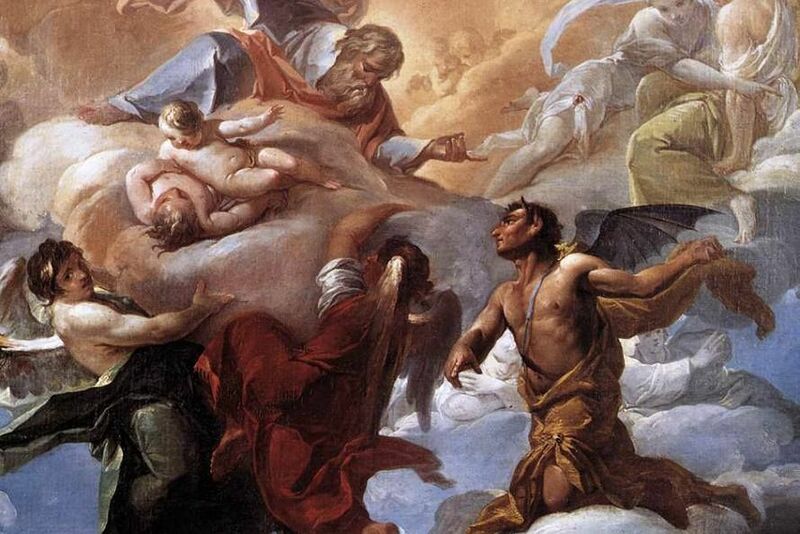 To help you in this question, I have affixed as seen above, to the primary fundamental question asked or as posed in this Article/Message – “Did GOD Provoke Satan To Attack Job?” – with the now retrospective question: REALLY…?? I think in the gist that is packed into this quizzical word, certainly says it all. This which cries out to GOD in my such humbled defence that – GOD DID NOT DO ANY SUCH THING TO JOB. Yes, this subject has been certainly debated and discussed by many over the long history of this perplexing quandary. Therefore, I am putting forward for the very first time here, what is evidently an entirely different and new ‘Argument’ in such continuation from Part One. This which is in all sincerity for a ‘Defence of GOD ALMIGHTY’, if I may humbly say this. Not that GOD needs any defending at any time, but this as intended here, is to bury this perplexity, this quandary that still persists unashamedly with us Christians as such, once and for all. For it is significantly against GOD ALMIGHTY! This being of the charge, the indictment that GOD DID PROVOKE SATAN TO ATTACK JOB. However, this has been as evidenced and proven without a shadow of doubt, as such, to be totally defective as in the earlier Part One. This Part Two, is prepared for your timely edification to spiritually benefit you in this Job matter. And I want to bring you even much closer to be understanding this Job and also his three friends better. 15Though hee (The ALMIGHTY) slay mee, yet will I trust in him: but I will maintaine mine owne wayes (freewill choices to make) before him. Beginning in this Part Two, we learn first from Job himself, that both the ‘Believer’ though being godly, and the ‘Unbeliever’ being ungodly, as in the Belief of GOD ALMIGHTY, yet do suffer hardships and human tragedies of all kinds, similarly as each other. And evidently, as we see often in the events of life, both such can also prosper just as well. This despite of being at the opposing ends of this ‘Belief in GOD ALMIGHTY’. For as you may know even through other Biblical Book Scriptures, as in the Gospel according to Matthew 5:45 – the rain falls on the just (good, Believer), and as well on the unjust (evil, Unbeliever). Also, that the sun rises on the good, just as it does on the evil. And the list can go on and on in such similar addition. Yet taking careful note in this, that the deceived and the deceiver are HIS – This referring only to people, take note: Job 12:16-17 refers. 16 With him is strength & wisedome: the deceiued, and the deceiuer, are his. 17 He leadeth counsellers away spoiled (deprived, unfit for the work), and maketh the Iudges (Judges) fooles. 9 The Lord is good to all: and his tender mercies are ouer all his workes. This ‘understanding’ was similarly spoken by Job, in answering his three visiting friends of their sin accusations over him. And yes, both the good and the bad/evil persons can go through disasters, and both to be receiving plenty as well. This Job knew and therefore was willing to suffer under all the devastation that had come over him. This he had also said to his wife as in the end of this devastation, Job 2:10 confirms. 10 But he said vnto her, Thou speakest as one of the foolish women speaketh; what? shall wee receiue good at the hand of God, and shall wee not receiue euill? In all this did not Iob (Job) sinne with his lippes. 13 Hold your peace, let me alone that I may speake, and let come on me what will. 14 Wherefore doe I take my flesh in my teeth, and put my life in mine hand? 15 Though hee (The ALMIGHTY) slay mee, yet will I trust in him: but I will maintaine mine owne wayes (freewill choices to make) before him. 16 Hee (GOD) also shall be my saluation (salvation): for an hypocrite (unbeliever) shall not come before him. 17 Heare diligently my speach, and my declaration with your eares. 18 Behold now, I haue ordered my cause, I know that I shall be iustified ( justified: found not guilty of sinning ). 19 Who is hee that will plead with me? for now if I hold my tongue, I shall giue vp the ghost (silence doesn’t bring remedy or answers, but only possibly more punishment, death, and even eternal death due to ignorance, due to not seeking, asking the Almighty). What Is Then The Difference Between The Godly (Believer, Righteous) and The Ungodly (Unbeliever, Unrighteous)? Just to touch lightly and briefly on this matter: As far as challenges, blessings, favours, riches, plenty, good times, bad times, evil times, tragedies, sicknesses, etc., no differences probably can be seen between both as such. Yet observing, all of this is in the physical realm and in the present! And yet when we all, when we move into the spiritual realm, both into the future, then it is an all brand new ball game for all concerned. And then the differences can be appreciated quite remarkably disparagingly major indeed, and most defining for all. And this will be one way or the other in such GOD’S Judgment, YHSHUA’ Judgment. By the ONE and Same, Saviour and Messiah – GOD WITH US. GOD in the FLESH, having come down here to earth from Heaven, and dwelt among us for a time, some 2,000+ years ago. There will be no in-between. No lukewarmness situations and/or places to refuge. No purgatory type of sure safe havens as evidenced in man’s hopes and aspirations for in the afterlife, hereafter. It will be all just Heaven or Hell! Therefore, the differences between the Godly and the Ungodly, comes unfortunately for most if not all of us Believers as well in the LIVING GOD, at the very ending of life. And this also on the Day of Judgment. This is most evident to us Believers now in CHRIST JESUS, more than ever before, through the complete Word of GOD. Amen. Others may have their own scriptural view points on this, so be it. Yet for our guidance for now let us also pay attention to the following few Scriptures as well: Heb 10:26-31; 1 Peter 4:17-19. 27 But a certaine fearefull looking (expectation) for of iudgement (judgment), and fiery indignation (GOD’S ANGER, WRATH due to our misconduct, wrong doings, sinning), which shall deuoure the aduersaries. 29 Of how much sorer (worse) punishment suppose ye, shall hee be thought worthy, who hath troden vnder foote the Sonne of God, and hath counted the blood of the couenant (covenant) wherwith (by which) he was sanctified, an vnholy thing, and hath done despite (insulted) vnto the spirit of grace? 30 For we know him that hath said, Uengeance belongeth vnto me, I wil recompence (repay), saith the Lord: and again, The Lord shall iudge (judge) his people. 31 It is a fearefull thing to fall into the hands of the liuing (living) God. 18 And if the righteous scarcely be saued, where shall the vngodly (ungodly, the unrighteous) and the sinner appeare? 19 Wherfore (Therefore), let them that suffer according to the will of God, commit the keeping of their soules to him in well doing, as vnto a faithfull Creator. And so the ungodly, meaning the unbeliever, the unrighteous gets certainly condemnation into hell, into the fires of hell, and this is for all eternity as well – the second death! And these are, as the Scriptures also inform us, already judged by GOD ALMIGHTY. Meaning even as of now whilst living in the physical realm, and then of course in the spiritual realm in such continuity! 1 Cor 5:13, 6:2, 6:9-11 as some examples of this. 10 Nor theeues, nor couetous, nor drunkards, nor reuilers, nor extortioners, shall inherit the kingdom of God. 11 And such were some of you: but ye are washed, but ye are sanctified, but ye are iustified in the Name of the Lord Iesus, and by the Spirit of our God. And therefore, still it could be for them, if there is a change of heart by some miracle change. For there is still hope in GOD always for the individual, even the LGBT. And this term has new identities added to it. That it is now referred to as LGBTQQIA. You have to Google this for more information on these new extensions. However, there is no escape once in hell though. And yet as we each live here and now, Salvation in the Redeemer, CHRIST JESUS is our only hope for anyone. And it is freely available for everybody who Believes in YHSHUA (JESUS). Amen. PRAISE GOD. And yes, therefore, this is our only escape from this fiery indignation, hell condemnation. Hebrews 2:3-4 confirms. 4 God also bearing them witnesse, both with signes & wonders, and with diuers (divers) miracles, and gifts of the holy Ghost, according to his owne will? Remarkably, Job knew of this even far back in the OT Biblical times of his era. This meaning possibly around 3,800 years ago! Yes, he did, that long time ago…..
You may be thinking that ‘My Redeemer Lives’ is more of a relatively recent time understanding, and in such reality fulfilled as in the NT times since about 2,000+ years ago. Then you may need to rethink again with regards to this, and what Job reveals here to us in his deeper insight of such matters. So there is more to this Gentile Job, than all of this Satanic devastation as well after all. Remember, this came from Job himself. He spoke it and revealed it to us through the powers of heaven. No other had done this in the entire Scriptures, apart of course our Redeemer JESUS CHRIST WHO LIVES! Amen. PRAISE GOD. And we now sing this through all over the Christian World. And at times, as we sing this, many with tears unashamedly running down faces in our brokenness, in our asking for forgiveness and mercy from GOD in our confessing of some sins committed. And also the tears are for the wonderment of the GOD we serve and love so dearly like no other! Simply the greatest privilege indeed that the world has ever come to know from generation to generation in CHRIST JESUS. And perhaps all this is the exact reason, which was supposedly found fully adequate, fully acceptable and spiritually satisfying, completing for Job to live as he did as a Believer. Though being at first before this conversion, a pagan, a Gentile, an idol worshipper. Amen. PRAISE GOD. And since then Job in such fear of GOD, in such holy reverence for GOD, as he also eschewed evil –This now, Living a Sin free Life in the Sight of GOD ALMIGHTY. 17 What is man, that thou (GOD) shouldest magnifie him? and that thou shouldest set thine heart vpon him? 27 Whom I shal see for my selfe, and mine eyes shall beholde, and not another, though my reines (the loins, the inner physical) bee consumed within me. It is simply amazing how Job knew all of this so well in advance, thousands of years ago. I on a personal level, just cannot fully process this in my heart and mind. It is simply awesome, beyond words to fathom. For us we now know for sure, WHO is the REDEEMER to come, and that HE has come indeed – This, JESUS CHRIST (YHSHUA) – Our SAVIOUR and GOD – THE MESSIAH for the world, that whosoeuer beleeueth in him, should not perish, but haue euerlasting life. Amen. Yet Job did not know this was to be YHSHUA, JESUS CHRIST; yet he knew HIM as: MY REDEEMER (Lives). To us Christians, we knew this for 2000+ years now. PRAISE GOD. Therefore, inferred in this awesome knowledge as seen above in Job 13 and 19, Job may have known also about YHSHUA’ Resurrection! Meaning, possibly also of the Cross indeed. For one is inevitably interlinked to the other inseparable. For if our (my) Redeemer Lives, as Job ascertains most evidently in the above Scripture, it also means that YHSHUA had to die also as such. And we now know this to have taken place for certain, yet it was in the future time from him. And this some 2,000+ years ago from us now! Simply remarkable. 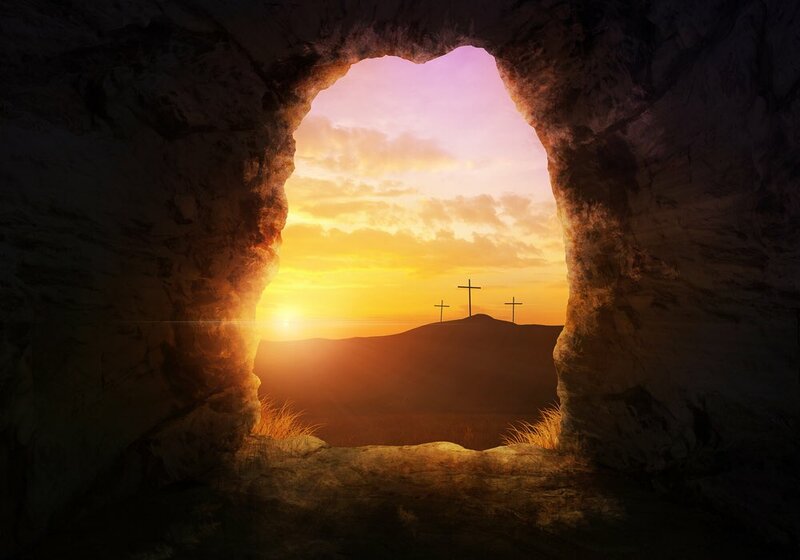 And if our Redeemer Lives, than it also means HE was Resurrected from the dead! Just as YHSHUA had assured us, this will take place on the third day of the Cross. And HE did indeed Resurrect on the early Sunday morning, on the Third Day. PRAISE GOD. And this in such retrospect, looking back to Job’s Biblical time – Job says, My Redeemer Lives! Simply awesome. Amen. PRAISE GOD. And in the consequence of such holy living, when the evil devastation of Satan came upon his possessions, his entire household, and then also upon his own life, his person. This was how Job chose to answer all the sin, sinning accusations that were relentlessly hurled at him, but certainly wrongly and unjustified indeed at every level. This was the case from his three visiting GOD fearing friends. All of Semitic lineage, and therefore Israelites by this ancestry. And yet they as Job puts it regarding them in their post destruction visit to him, to being unfortunately…..miserable comforters are ye all – Job 16:2 confirms this. This Israelite connection, could also possibly suggest besides the other two reasons as already given in Part One, that Job may have come to also knowing in some introductory manner as well, about the LIVING GOD, EL SHADDAI (ALMIGHTY GOD), through these such Israelite friends. And though they brought the sin accusations against him, it was with good intentions indeed. That was for him to repent of his sin, sinning, to GOD before more suffering, if that was still possible, should come his way. For they were totally convinced, each of them of this very thing. This possibly as per their own understanding of the Scriptures, and even perhaps in their own personal experiences for sure. And therefore, this was the case for Job’s present untold suffering at that time – GOD was punishing him, yet how, in such evilness?? GOD IS MERCIFUL. Simply not possible as far as I see this evilness in Job’s devastation. Yet Job knew for certain in his righteousness, not in arrogance but in humble uncompromising righteousness, they were all completely wrong in their sin accusations at him. For he had not sinned against GOD, nor against his fellow man. And we too knowing this now through the Scriptures, as he was evidently declared by GOD, to be a perfect (blameless) and upright (righteous) man. One who fears GOD and eschewed evil, and there is none like him on the earth – meaning, greatest of all the men in the east. What a testimonial and that also from GOD ALMIGHTY!! And as such, none of them could speak to Job, due to the shocking situation that had confronted them. For they could not even recognize Job as being their good friend of before. For obviously, he was well known to them for sure! That was the human mess that Job was in at the time, in the aftermath of Satan’s destruction over his possessions, his household and finally upon him, his person. And therefore, neither was Job able to speak to them. Not for just one day and one night since their arrival, but for seven days and seven nights!! This is because of his grieving sorrow in such grave emotional breakdown, that had also certainly enveloped them all as well, at his utter brokenness. This expresses and captures the human saga at some level, and of the total humanness of Job in his unbelievable devastation at the evil, merciless hand of Satan. Yes, merciless and totally evil. And yet this Job greatly grieving, has gone mainly missed, not due to this devastation that had taken center stage for sure. For probably of how he had reacted at first, when the shocking news was brought to him, that all his young seven sons and quite obviously his three daughters also, were killed. And this too at the same time, on the same day, in the same place, meaning in the same house – in the eldest brother’s house. And this while they were all feasting and drinking wine among themselves. Simply devastating and unimaginable, that such can befall one family, and in such rapid succession! Meaning his entire family was wiped out. And just shortly before this, Job received news, that all of his livestock possessions were also taken away, and all of his servants were also killed. Just like that. All Gone! There is a huge warning for us in this too. In this suddenness of destruction that may come upon any. So don’t take things for granted in anything at anytime. Whether it is in your health, in your finances, in your relationships and above all in your accountability to GOD always. We as far as I know, are not asked to be reporting this accountability on a regular basis from time to time at some heavenly appointed place, to GOD. Just as the celestial beings and Satan had to do and are still doing even as of now as well. Yet remember GOD sees everything and yes, there will be a time when this will happen to each and every one of us for certain. More certain than whether the sun will rise tomorrow for the world, well at least half of it at any one time! And so Satan, leaving only just the single messengers left alive by him, and this for a specific purpose. Yes, Satan was behind this all, as they were spared by Satan to unfold the devastation to Job. That was each time it had taken place, to report this to Job, in this rapidness of these happenings as well. Satan, not giving any chance for Job to even understand, breathe or to recover from what had really taken place from one crisis devastation to another. Or to get some semblance of stability to manage what had taken place. No, Satan was indeed mercilessly ruthless in his Satanic all out attacks on Job. And so it is simply ridiculous for as many as have suggested and that by Christians, Leaders in the Ministry and Teachers of the Word of GOD, that GOD ALMIGHTY had evidently engaged Satan as a tool, as an instrument in this total devastation of Job. And in such continuity, GOD even does this regularly also, as they maintain this ridiculousness theology, against others from time to time. They who have suggested this in the past and those who still do adamantly as of now, must be evidently insane….possessed, or at the least blinded from knowing the Scriptural truth. This was obviously Satan’s psychological strategy of attack in this, to devastatingly break Job down with such rapid and successive destruction. So that the evil and merciless Satan could achieve the outcome that he wanted to extract from Job at all cost. And that was for Job to curse GOD to HIS FACE! However, this time to have another go at Job, Satan wants to do this, without GOD’S Divine encumbrance in the way. That which was well known already to Satan, that which to being GOD’S Hedge of Protection over Job, and over everything that he had at the time. This as was also already established in Part One most evidently. And Job too shortly after, was not spared in this final suffering. For he too had come extremely close to being killed himself by Satan as well. And yet he was saved in this, due to GOD’S Commandment, that Satan cannot kill him. This despite, GOD having removed the Hedge of Protection earlier from him. So, I hope you do realize now to be more greatly convinced, that the devastation brought over Job, was all Satan’s doing. For it was Satan’s idea all along, from the very beginning to attacking Job, to destroying Job, and above all to have Job to turn away from GOD. 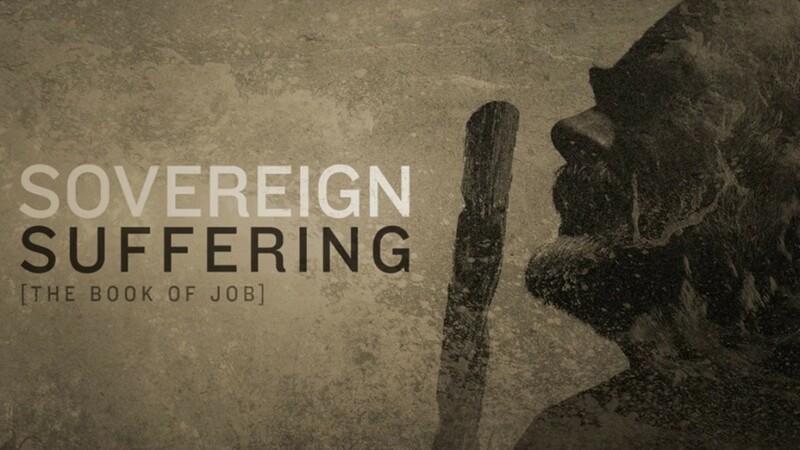 GOD was not in it ever from the very beginning, Sovereignty and all in this earthly Satan’s encounter with Job! These are the fundamental Divine Truths as derived from these Job Scriptures on the whole, that you will discover here in this Article/Message. Well this devastation by Satan, then finally ends, leaving his grieving wife alone with Job only. How she was spared in all of this Satan’ devastation, may be up to anybody’s guess. And yet, noted for his craftiness, his cunning, Satan had specific purposes for her to be left alive by him, as I see this further unfolding here. This was to be engaging her in her truly brokenness state for sure, in this devastation that was brought upon them, to be played one more further time by Satan in his evil plan. That is through the circumstance that she now suddenly finds herself in, Satan knew for sure that just as he had engaged Eve, wife of Adam, to get Adam to take and eat of the forbidden fruit. And because of this very thing, to have sinned against GOD, it won’t be long before Job’s wife would surely confront Job on this turmoil, this tragedy or rather tragedies that have befallen them. Please listen now: Satan’s plans here with Job’s wife was the same! Through this suffering, through this devastation, the circumstance itself will coax, will challenge and probably even for her to demand outrightly of Job, to be cursing GOD! And she did, due to this horrendous devastation to her entire family. For this too was also factored into this planned evil achievement and strategy of Satan. To very nastily and yet craftily get her pushed into doing this, as evidently established in Job 2:9 accordingly. As I see this, Job could have very easily also ended up the same as with Adam. If not for his amazing resolve, his fortitude and spiritual strength of Job, her husband. And above all this his acute awareness of many deep spiritual things, including in his fear of GOD, holy reverence for GOD and that he eschewed evil always, as all of this is also evident in Job 2:10 which follows. Amen. 9 Then saide his wife vnto him, Doest thou still reteine thine integritie? Curse God, and die. Job 1:18-22 refers and confirms the first reactions of Job to this rapid devastation that had befallen him, so suddenly, out of the blue so to speak. 18 While he was yet speaking, there came also another, & said, Thy sonnes, and thy daughters, were eating and drinking wine in their eldest brothers house. 19 And beholde, there came a great winde from the wildernes, and smote the foure corners of the house, and it fell vpon the yong (young) men, and they are dead, and I onely am escaped alone to tell thee. 21 And said, Naked came I out of my mothers wombe, and naked shall I returne thither: the Lord gaue, and the Lord hath taken away, blessed be the Name of the Lord. 22 In all this Iob sinned not, nor charged God foolishly. And to understand all his grief and his choking emotion in such sorrow for days and weeks and more without end, you then have to read Job 2:11-13. This as his friends describe the grieving scenario to us, as recorded by the writer of Job. 11 Now when Iobs (Job’s) three friends heard of all this euill (evil), that was come vpon him, they came euery one from his owne place: Eliphaz the Temanite, and Bildad the Shuhite, and Zophar the Naamathite; for they had made an appointment together to come to mourne with him, and to comfort him. 12 And when they lift vp their eyes afarre off, and knew him not, they lifted vp their voice, and wept; and they rent euery one his mantle, and sprinckled dust vpon their heades toward heauen. 13 So they sate downe with him vpon the ground seuen dayes, and seuen nights, and none spake a word vnto him; for they saw that his griefe was very great. And yet Job continued as before, despite this horrendous devastated state, that he and his wife had suddenly found themselves in. For he feared GOD and eschewed evil. Yes, he did. Without cursing GOD or having sinned with his lips, though completely broken in his mourning and sorrow as also witnessed by his three friends as well. Simply amazing, this Job! What a Believer…..And that too also in the knowledge of the Redeemer, and Salvation, besides that of the ALMIGHTY – EL SHADDAI. And all this in the hearing of the Word. This from those around him, and of those that with whom he came into contact with, and they with him, in his semi-nomadic lifestyle. 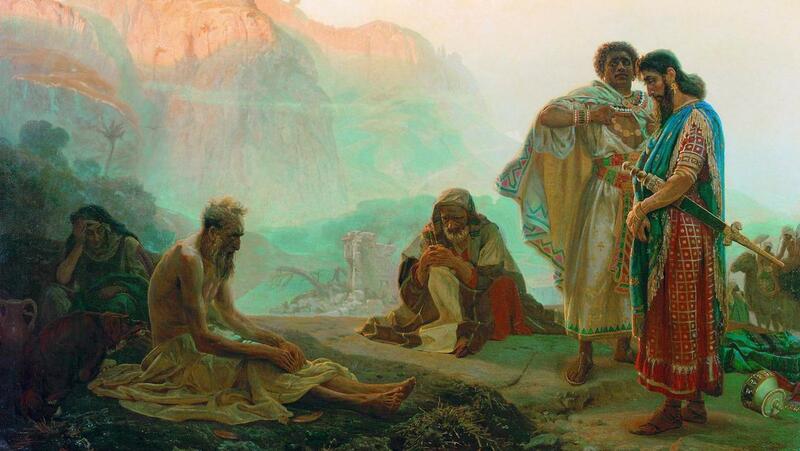 Then at the end of these 7 days and 7 nights, Job finally spoke to them, cursing the very day that he was born! Simply tragic….who can blame him. Job 3:1-26 refers and confirms. And in the process, they began also talking to him, one by one in this such accusatory manner, and not in a comforting manner, though inadvertently. And Job in answering them, affirmed to them, one by one also and as a group, that he was innocent of all their wrongful sin accusations hurled at him. See you in PART THREE in the next few days, GOD Willing! NATURE’S WRATH OR GOD’S JUDGMENT?